Rabbi of Sardokupis (Serai Keui? ), Asia Minor; flourished at the beginning of the seventeenth century. He was the author of "Maḳor Baruk" (Smyrna, 1659), responsa arranged in the order of the four Ṭurim. 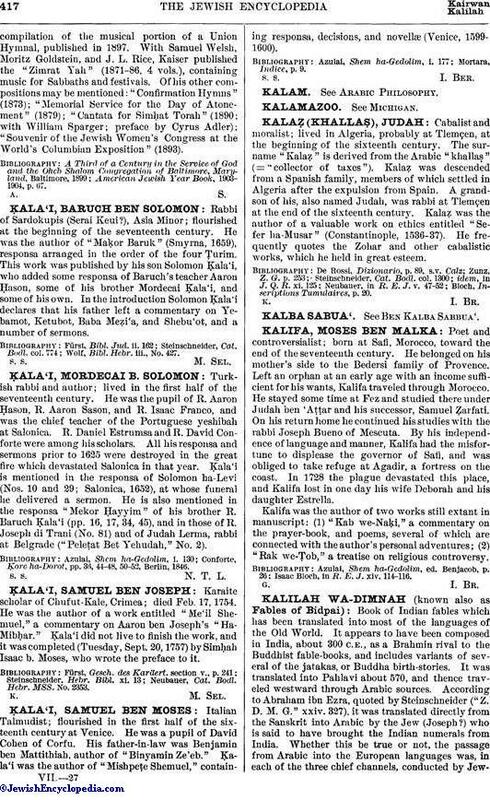 This work was published by his son Solomon Ḳala'i, who added some responsa of Baruch's teacher Aaron Ḥason, some of his brother Mordecai Ḳala'i, and some of his own. In the introduction Solomon Ḳala'i declares that his father left a commentary on Yebamot, Ketubot, Baba Meẓi'a, and Shebu'ot, and a number of sermons. Wolf, Bibl. Hebr. iii., No. 427.